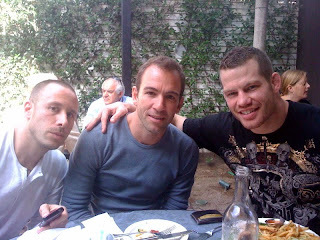 Here I am with @BryanCallen and @DovDavidoff. I met Bryan this year working on the set of "Warrior" and he's one of the funniest, if not the funniest guy I've ever met! I just met Dov today and he was cracking us up just as much. Now we are headed to Denver so I can train.